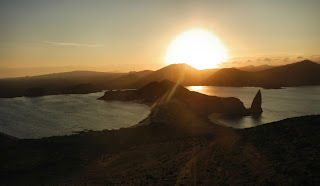 This is the first of a series of blog posts in which I will focus on frequently asked questions about travel to Galapagos. Of all the questions I get, the most common is, "Should I tip on the cruise ship and, if so, how much?" It might appear that, as a guide, I have a conflict of interests. So, when directly asked "How much?" by a cruise ship guest, I typically say something to the effect, "We always appreciate a tip and the amount is up to you." The truth is that the crew and guides on cruise ships usually do get tipped and rely on tips to supplement their income. Galapagos is a very expensive place to live; many things cost three times more than on the mainland. But, cruise ship salaries of guides and crew do not reflect that economic reality. This might be something to keep in mind when tipping. Why are tips given at all? Tips are given to recognize service and to show appreciation. Tips, while pro forma, are equally a reward for the service you receive. You typically tip more at a fine dining restaurant than at a diner or for great service versus ordinary service. Ask yourself, when tipping: Did you have a great experience and did your guide and crew contribute and make your stay memorable? Are you on a luxury or economy trip? Consider factors such as this when calculating your tip. According to Lonely Planet: "Elsewhere your expected tip is around 10%, so that is what is expected in Galapagos, ie. 10% of the cost of your trip. Yes, Galapagos is expensive, so is living there, and no most people don't tip the full 10%, but on the better boats tips are obviously much better, whatever you give will normally be divided into 2 parts, half to be divided between the crew, and half for your guide. Remember tipping in Ecuador is scaled partly by quality of service ... Salaries are actually not that high, boat owners expect their staff to earn good tips supposing that [guide and crew] will do better jobs to earn better tips, so much crew members expect to live from their tips." Happy Gringo suggests a per person tip of $10-15/day on standard tours and $15-20/day on luxury and deluxe tours. Detourdestinations.com suggests $8-15/day for your guide and an additional $8-15/day for the crew. Discovergalapagos.com recommends tipping guide and crew separately saying, "As a general rule of thumb, we recommend between $10-$15 US from each passenger to each group per day. If you have received very good and exceptional service, please be more generous." TripAdvisor has two separate threads related to Galapagos tipping. The 2009 thread is out of date, out of sync with more recent sites and does not reflect the cost-of-living increases in the past 6-7 years. The more recent 2014-2015 posts suggests 3-5% of the cost of your cruise, which comes out to about $200 per person per week, divided equally between crew and guide. I found in my reading that a few posts by TripAdvisor contributors were very thoughtful on the topic of Galapagos tipping. One reads, "... food was fantastic, every day was better than the last, folks were very congenial, spent lots of time answering our questions ... and they all shared without our even asking. In the end, we left a rather handsome tip and wished we could have left more. So take the money and then put the whole issue out of your mind until the trip is over, at that time make your decision and do what you feel is right." The other says, "I know there are arguments that the boats should pay everyone a good wage (and fold the costs into the prices of the cruise). But most don't. So tipping looms large. To my mind, the many sacrifices that everyone on board makes--e.g., being away from family and friends often for weeks at a time, living in cramped quarters--even in a glorious setting such as this are almost unimaginable to me." Additional guidance and a word about certain misconceptions that some guests might have is available at this link. When calculating your tip, consider your guide's experience, knowledge, presentation and effort. Remember, your guide is on duty 24 hours a day for each day of your trip. When you are resting between excursions, your guide is likely to be planning that night's talk, assisting another passenger with special requests or filling out the enormous amount of paperwork that is required during and after each trip. Just because you don't see the guide doesn't mean he's not working for you. You might also want to read my post regarding ethical/responsible travel, which will provide insight into how to get the most from your vacation (no matter where you travel) and how you can leave a lasting and meaningful impression of your own. Did you have a marvelous time, a vacation to remember? Did you learn from your guide? Did your guide inspire you? Did the guide and crew always go the extra mile? Design your tip accordingly. When most people think of family cruises they've usually had their opinion colored by others and assume that cruising isn't for them. However, read assignment services review to find out the best way to plan the marvelous holiday, a reality of a dream!